See what I mean? CUTE! 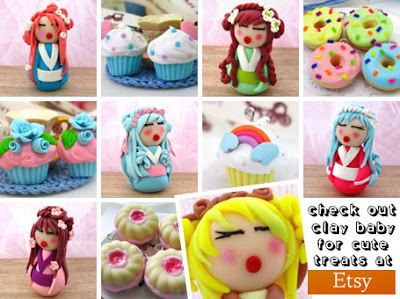 Clay Baby is an Etsy shop that sells a fantastic range of handmade polymer clay charms that simply ooze with kawaii cool! And believe me when I say, each and every one of these beautiful pieces look absolutely gorgeous - it’s like stepping into a miniature kawaii bakery! Delicious! And, as if that wasn’t enough for you lucky readers, there’s even some super cute kokeshi dolls too! Brilliant!